Review of Cantillon Rose De Gambrinus | Beer Apprentice - Craft Beer News, Reviews, Interviews and Info. Hi guys. I have a very special craft beer for you today. I’m lucky enough to have in my possession a Cantillon Rose De Gambrinus brewed by the Brasserie Cantillon located in Brussels, Belgium. I have never been privileged enough to get to try a Cantillon of any kind, so I’m really excited about it. One happened to be available at my bottle shop the last time I visited and I snatched it up pretty darn quick. 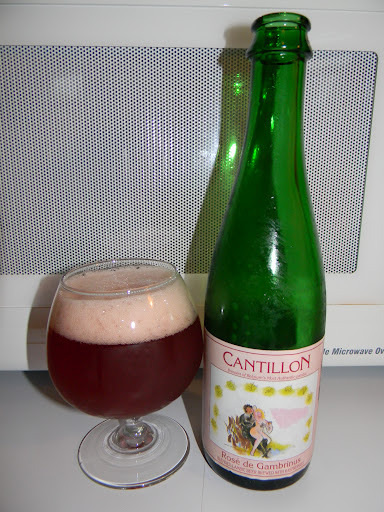 There is a rather lengthy description of the Rose De Gambrinus on the Cantillon website, cantillon.be, so I would highly suggest that you take a moment and read all about it. I can’t wait any longer. Let’s pour this thing. This brew comes in a 12 oz. bottle and it has an ABV of about 5.0%. The beer poured a mostly clear, cranberry to rose color. The head had a rather noticeable pink tint to it that was of good size, but quite fizzy. Kind of like a soda-pop with a lot of snap, crackle and pop. The retention time was not anything to brag about and the lacing was sparse to say the least. The smell however, was wonderful. Lively hints of bright raspberry and flowers. A compelling aroma of that familiar “Barnyard funk” along with a valid sourness. Tones of wet hay and yeast brought about an “earthy” appeal that was somewhat counterbalanced by a light tinge of vinegar. Very well harmonized and appealing I thought. Just an all around, great smelling beer. The taste was more of the same. Nice and sour with a tart, acidic raspberry fruit. Some other citric notes were noticed too. Similar to lemon or lime. The “funk” really hit home on the back end. Additional flavors of wet hay, a touch of oak and a light mustiness brought about more of the “earthy” component. The vinegar relish was accounted for in the taste also, but the overall strong, “lip puckering” aspects really smoothed out as I worked my way through the bottle. Once more, very well balanced, harmonious and complex. The mouthfeel was medium bodied. It was very dry. Even wine like in the dryness. It was sharp and biting, refreshing, although not so much thirst quenching. The carbonation was good and a great deal of flavor was left behind long after each sip. Well, my first experience with a Cantillon did not leave me disappointed. This beer was delicious. Even though I didn’t find that the appearance was all that great, which in turn brought my score down a bit, the aroma and flavor were outstanding. A lot was going on here and it’s fairly obvious that this is a well made beer. It really smoothed out nicely as my palate adjusted, thus making the drinkability factor rather good considering the complexity of the taste and the extreme dryness. I would love to find another bottle of this. Or better yet, find another style and really get a grasp of what this brewery has the ability to do. If the Rose De Gambrinus is any indication, I doubt that I would be discontent with any of their efforts. I will say that if you are interested in exploring the Lambic style, this beer may not be the best place to start. It begins with a powerful funk and sourness that could easily turn people off if they are not ready for it. Either way, if you guys happen to see any of them, give ’em a try and tell me what you thought.